What do you really need in a modern TV these days? Picture quality is, of course a given, with terms like “4K”, “HDR”, “FALD”, and “Quantum Dots” being thrown around in marketing spiels and materials. With increasingly connected homes, Internet connection for streaming is almost expected as well. Maybe even some smart home control, too. And beyond being just functional, these “smart” TVs are expected to look just as nice as any decoration in your living room. In all but one of those, Vizio’s 2018 P Series promises to check all those dots. And so we take it for a spin to see, no pun intended, if it can deliver. The days of boxy, purely utilitarian TVs are so long gone, that kind of television set now only appears in period drama or science fiction. These days, TVs, whether smart or otherwise, are designed to blend with your living room decor. Some are even meant to disappear into walls! Vizio may be known for being a “budget-friendly” brand but that definitely doesn’t mean that it looks cheap. In fact, the 2018 Vizio P Series proves exactly that. The Vizio P was designed to deceive you into thinking the TV was floating. Or at least standing on thin, fragile-looking legs. As they say, looks can be deceiving and those metal caltrop legs are sturdy and stable. They are spaced wide apart, though, almost at the edges, which might be something to consider in planning where to place the TV. Those impossibly strong feet hold up the sleek silver bottom edge of the TV, perhaps the most noticeable part of the Vizio P’s face. That’s because the rest of the edges are practically thin black strips that contrast with the silver bottom, creating a floating illusion. In contrast to the fine-looking front, the profile and rear of the Vizio P seem best to be hidden from sight. The TV lies on the thick side, which makes the feet’s supporting role even more impressive. The edges at the back are curved, as if to compensate for what would have been a very blocky box. This part of the TV remains truly utilitarian and, fortunately, it does that rather perfectly as we’ll see later. Suffice it to say, the Vizio P TVs will feel no shame when put next to expensive furniture and decor. Of course, a TV doesn’t only need to look good in terms of appearance, it also has to look good in terms of display. Unsurprisingly, the new Vizio P TVs make generous use of today’s industry buzzwords. Fortunately, Vizio isn’t just all talk. These days, 4K is almost a given for premium TVs. What’s more important that supporting that resolution is being able to make good use of those pixels. In practice, that often means supporting an extremely wide range of colors and HDR, often through UHD. There are actually two (or three) competing HDR standards today and, fortunately, the Vizio P supports all of them. That includes the more standard HDR10, Dolby’s proprietary Dolby Vision, and the new kid on the block, HLG or Hybrid Log-Gamma. That said, Vizio has a special preference for Dolby Vision, extolling its color fidelity and scene-to-scene dynamic range adjustments from camera to post-production. Add to that Vizio’s own “Ultra Color Spectrum” and you are promised a range of colors that even exceeds the industry standard DCI-P3. Color, however, is only half the visual equation. The other half that can make or break the experience, no matter how vivid or expansive the colors might be, is brightness along with its twin, contrast. For the former, Vizio boasts that this year’s P series maxes out at 1,000 nits of brightness. Given that 2017’s P TVs only had up to 600 nits, that’s no small improvement. This year’s model averages at around 860 to 950 nits, which is an impressive leap forward. But turn on Vivid mode and you can even hit 1,000 nits or higher. Even more so when you consider it doesn’t have any fancy quantum dots tech to rely on. Just as or perhaps even more important is the darkness. Considering the technology used, it is easier to brighten up the screen than to make blacks really pop out. This is also the area where the Vizio P series stands out the most not just from its predecessors but also from its competitors. The LED-backed LCD’s use Full-Array Local Dimming (FALD) and it makes the feature available on all three Vizio P sizes, unlike other brands. So whether you get a 55-inch P55-F1, a 65-inch P65-F1, or a 75-inch P75-F1, you’re still assured of better dimming capabilities. That said, the smaller models do get fewer dimming zones, a critical metric in determining how dark the dimming can be. The P55-F1 has 56 dimming zones, the P65-F1 gets 100, and the top of the line F75-F1 boast 120. The only other non-Quantum non-OLED brand that can beat Vizio in this metric is TCL, which doesn’t offer a 75-inch option from its current stable of TVs. Color, brightness, and contrast all work together to produce vivid images that seem to come alive on the flat screen. Or at least they can make the darkest scenes decipherable and identifiable. In the Vizio P Series’ case, these three are delivered by Dolby Vision 4K HDR, 1,000 nits of brightness, and 120 FALD zones, 100 zones in the 65-inch model. At least that’s the theory. But how does it hold in practice? The good news is that it’s very good. The bad news? It might not exactly be the best. The Vizio P really delivers on its promises of precise dimming, even when there are fewer zones to assist. While it may be at a disadvantage against OLED TVs, it manages to hold its own against more expensive sets. The catch is that the same could be said of some more affordable LCD TVs, like those from TCL. For all its talk about colors, the 2018 Vizio P seems to produce less than vivid ones. SDR content, in particular, will look dull even if you switch on Calibrated Mode. The Vizio P also tends to lean heavily on blues and reds, making the colors a little less accurate than ideal, though that largely depends on the content as well. VIZIO tells us that, out of the box, the display should be fairly accurate as they have been calibrated right at the factory. The TVs overall performance, however, isn’t just measured by those factors, though they definitely take center stage. The 120 Hz refresh rate, available on all models, is a huge win for the TVs, putting them on the same level as more expensive sets from Samsung and Sony. That may, however, cause the so-called “soap opera effect” that some find a tad disconcerting. Fortunately, there’s an option to adjust the smoothing to comfortable levels. You can also avoid smoothing without giving up that sweet 120 Hz by setting Judder Reaction to 0 and turning on Clear Action. This will cause the image to cycle the backlight to reduce motion blur. As with any LCD panel, the Vizio P suffers from limited viewing angles. It does only start at around 45 degrees off-angle, but when it does, the quality drops quickly. Not a problem with small families sitting in front of the screen but could be an issue when it comes to group binge watching. A TV with a great screen won’t be of much use if you don’t have content to display on it. Fortunately, the Vizio P has tons of ways to get those content onto its LCD panel. There are, for example four HDMI 2.0 inputs with HDCP 2.2, a composite video input, and a USB port. Actually, it has five HDMI ports, but the fifth one is special. It’s the only one capable of 1080p/120Hz. This will matter most to gamers, who will appreciate the decreased input lag. That is, if they can live with the lower resolution. This year’s P TVs also witness the return of an old friend. The built-in TV tuner, absent from last year’s models, makes a comeback in 2018 and puts its again on the same level as its peers. With Vizio positioning the P series as the TV for cord cutters, being able to get free OTA TV without having to purchase a separate box or connector makes that claim all the more believable. The Vizio P Series isn’t just a 4K HDR FALD LCD TV. It’s a 4K HDR FALD LCD Smart TV. That comes in two parts. One is from the “apps” that deliver content from the Internet or your mobile device. The other is with its integration with smart assistants,which we’ll get to later. Vizio uses its own SmartCast platform for its smart TVs rather than reuse something like Android TV. So when it talks about “apps”, don’t confuse it with your typical smartphone apps just running on a large display. They’re more like channels for video and music streaming services and sources. Vizio has quite a few of them but it also has its own free WatchFree service that’s still to come, giving access to over 100 streaming TV sources like CNET, IGN, The Onion, and more. But if you already have those “apps” on your phone or tablet or even have some that aren’t available from Vizio’s list, you can also just throw your content (not your phone) to the TV. The Vizio P does have Chromecast built-in. No AirPlay though. Conversely, you can also use your phone as the TVs remote control, in case you lose the latter. Not that it’s easy to lose, being the big wand that it is. Of course, remotes far bigger have suffered that fate as well. The Vizio P’s remote control is something of an oddity. In an age where remote controls are being simplified or even rendered redundant, Vizio is overloading its own. As if it there weren’t already enough buttons, Vizio added more. Without totally being biased, the P Series remote has dedicated buttons for Vudu, Netflix, Amazon, Xumo, Crackle, and iHeartRadio. Everything else will have to make do with multiple button presses or smartphone taps. Or they could simply call on Amazon Alexa or Google Assistant. But don’t be deceived. The Vizio P Series doesn’t integrate Google Assistant nor Amazon Alexa. Instead, the TVs integrate with those assistants. Yes, you can control the TV with your voice using either of those two, but you’ll need to first have a Google Assistant or Amazon Alexa device, often a Google Home or Amazon Echo. Fortunately, your phone can probably do it too. 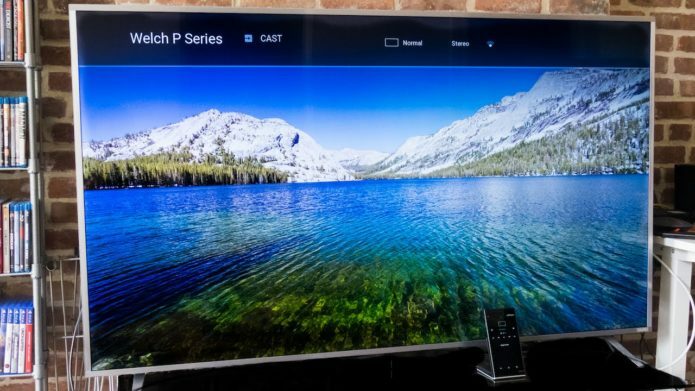 Is the 2018 Vizio P Series 4K HDRD Smart TV any good? Based just on features and performance, it definitely proves that Vizio can offer almost similar image quality and performance as more expensive sets from the likes of Sony and Samsung, especially when it comes to dimming. The problem comes when you start comparing it to what else is available along that price range, particularly from TCL. While the Vizio P beats TCL in some metrics, there are times when the performance differences are almost negligible. The price difference might also be something to consider. Right Now the 2018 VIZIO P starts at $1,099 at Best Buy, which is only $50 more than an equivalent TCL. So if you have the money to spend on a 2018 TV but not enough for a high-end, and more expensive, Quantum Dot model, you can’t really go wrong with a Vizio P. Just be aware that there might be cheaper options available that might not be as bad as they sound.